Spearhead, jammed for two-plus hours. Before Michael Franti and Spearhead even took the stage, the evening's tone was set by a ginormous backdrop of a Hindu deity wearing a gas mask, its six arms holding things like a gun and a bloody hamburger. Above it, a sign warned "Caveat emptor." Franti -- an anti-death penalty, pacifist vegan -- wore out a few soapboxes during his sold-out show Thursday at the Bear Tooth Theatrepub. No surprise there. Throughout his career, music and politics have been inseparable. The folks who don't share his politics just stay home, or find a Ted Nugent concert to go to. But all the buzz about Franti's politics distracts people from the key fact that he and his band Spearhead are gifted and versatile musicians. 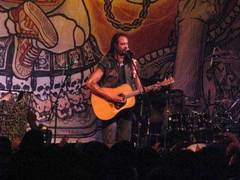 One minute, Franti channels Bob Marley. The next, he's spittin' like Kanye or strumming acoustic guitar and emoting a la Spring-steen. Bono certainly wishes he wrote the heart-swelling, arena-worthy "I Know I'm Not Alone." His four band members brought more than instrumental virtuosity: They all contributed vocally and displayed undeniable charisma and stamina. They played a generous 2 hours and 15 minutes -- unheard of at club shows. With dreadlocks that trail like bullwhips and springs for legs, the 6-foot-6-inch Franti is as intriguing in person as he is on paper. • Only a rat can win a rat race. • Are we part of the solution or part of the pollution? • You can bomb the world to pieces, but you can't bomb it into peace. But paired with the band's infectious reggae/funk/hip hop/rock musical arrangements, and with Franti's passionate and sincere delivery, the lyrics usually have an affirming and inspiring effect. The joint was wall-to-wall human popcorn, popping to the reggae beats -- mostly 20-and 30-somethings, although the Tooth's hippie contingent didn't disappoint. As the night wore on, the smell of pizza faded, replaced by a pungent mix of pot smoke and overexerted deodorant. The crowd positively vibrated with enthusiasm when the band broke into the volcanic "Yell Fire." The anthem's DIY-revolution message probably motivated a lot of audience members to spend their workday today signing Internet petitions. The good juju didn't stop with the last note. The guy ended the concert by jumping into the crowd and hugging people. Unless he's the next Brando, his heart really seems to be in the right place. Offstage, he performs for soldiers and civilians in Iraq, writes children's books with positive self-esteem messages and rocks the vote. That's why criticizing him feels a little like stealing from The Salvation Army or poking a nun with a stick. But there's no use denying it: His lyrics sometimes were trite and repetitive or like a bad social studies class flashback. OK, OK I get it. We are the world. Love thy neighbor. "Just say no" to child soldiers. Sarah Henning, nice of you to take time off from the Don Young campaign to catch Michael Franti. You state "But all the buzz about Franti's politics distracts people from the key fact that he and his band Spearhead are gifted and versatile musicians. "Who was distracted? All MF's fans at both sold-out shows? The shows were a sell-out becouse MF &amp; Spearhead have sucsessfully combined thought provoking social commentary with exceptionaly orchestrated music. MF has the leadership skills and charisma that very few others ever have. Perhaps that leaves you feeling threatened. It is unfortunate that you left the show apparently bored and uninterested in creating a better existence here on earth.But I understand. That may threaten such great Alaskan world enhancements as the Pebble Mine or investing PFD funds in Darfur. There is no excuse for ignorance.You may not be excused now.